You heard it here first: one day I will have a food truck that sells braised pig skin sandwiches. It will be WILDLY successful because pig skin is cheaper than dirt and deeply delicious. Almost everyone has heard of pork rinds, which are fried pig skin. Delicious as they are, pork rinds do not hold a candle to pig skin braised in tomato sauce. It is easily my favorite thing to eat. There is a roundness and a richness that lights up the pleasure centers of the brain. Eating it is like a big umami embrace. In my house growing up we lovingly and gluttonously consumed “everything but the oink”, aka the whole pig, as was the tradition of the Italian peasant stock from whom we proudly descended. While pig trotters and pig lungs are quite delicious, my favorite piggy part was always the skin. Braciole di cotenna in Italian (or cotica in some dialects) means “skin rollups” and while that may not sound delicious, I assure you, it is nose to tail cooking at its finest. Pigskin is the secret weapon and most essential component to achieving the silky richness that is the hallmark of the legendary Sunday sauces of Southern Italy. You cook the pigskin in the sauce low and slow. Put it on the stove sometime mid-morning and it will be done by mid-afternoon, perfect for an early Sunday supper. Serve the sauce over pasta as a first course, and the sliced skin as the second course. If you want to have a real feast add in meatballs, sausage and beef braciole and double the amount of sauce you make. Note: Finding pigskin can be a bit of a challenge. You will need to find a butcher that breaks down whole pigs. Ask the butcher for a piece of just the skin, about 15”x12”, with all the fat removed. If your pigskin still has some bristly hairs on it, you can singe them off at home by quickly passing the pigskin over a medium flame on your stove. 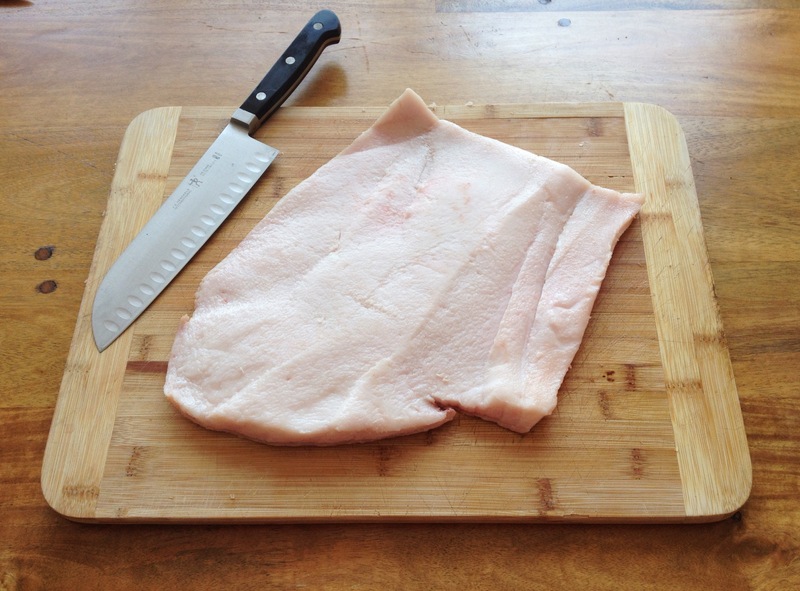 1.Prepare pigskin by laying it skin side down on a cutting board (the side that had the fat attached will be slightly oily, while the skin side will be more leathery). Sprinkle oregano, pepper flakes, grated cheese and ½ tablespoon salt evenly over pigskin. 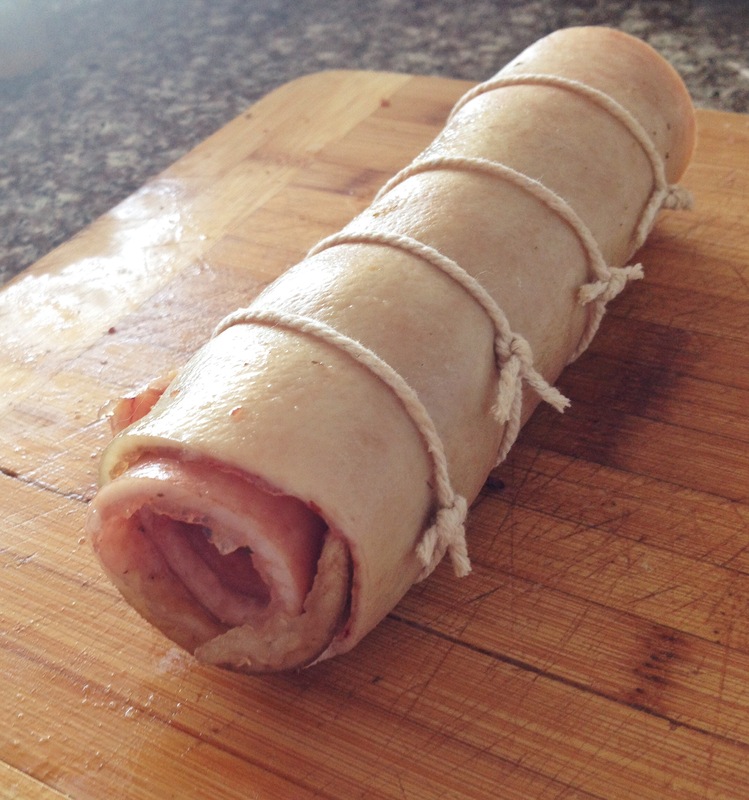 Roll up as tightly as possible and secure with butcher’s wine at both ends of roll and also in the middle. 2.Prepare sauce. Add olive oil (or lard) and onion to large stockpot. Sprinkle with salt and cook over low flame, stirring occasionally, until onions are translucent, about 8-10 minutes. Raise heat to medium, add in tomato paste and fry for about 2 minutes, stirring continuously to avoid burning. Add in tomatoes, bay leaf, wine and 1 can of water (28 oz.) and stir to incorporate. 3.Cook pigskin in sauce. Add pigskin to sauce and season with 1 teaspoon salt. Cover pot and use handle of a wooden spoon to vent the lid so it open just a bit on one side. Cook over super low heat 4-5 hours, stirring occasionally. The pigskin is done when it is very soft, but not falling apart. It should still have a bit of give (like al dente pasta), but should never be rubbery. If you are unsure about the degree of doneness, slice a bit off one end and taste it. 4.Remove pigskin from sauce. 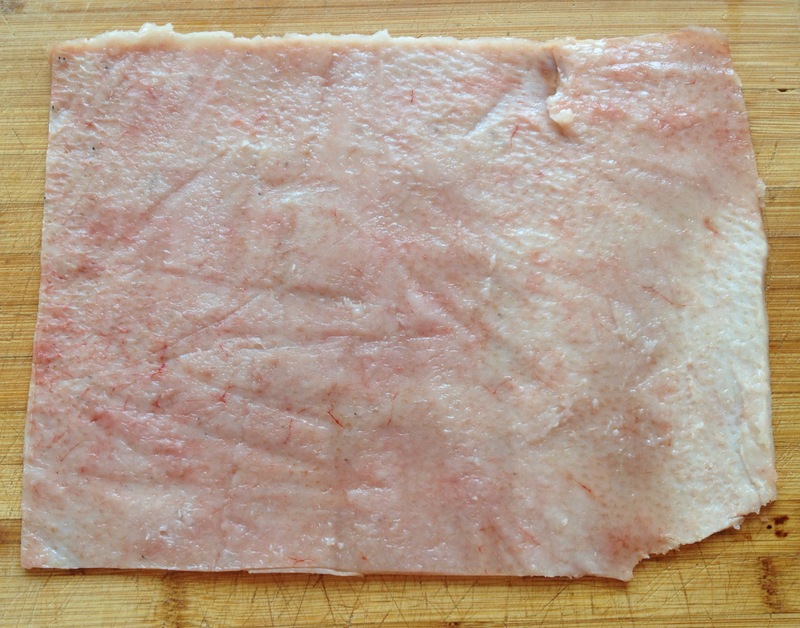 Remove butchers twine and cut skin into ¼ inch slices. Check sauce for salt and season, if necessary. 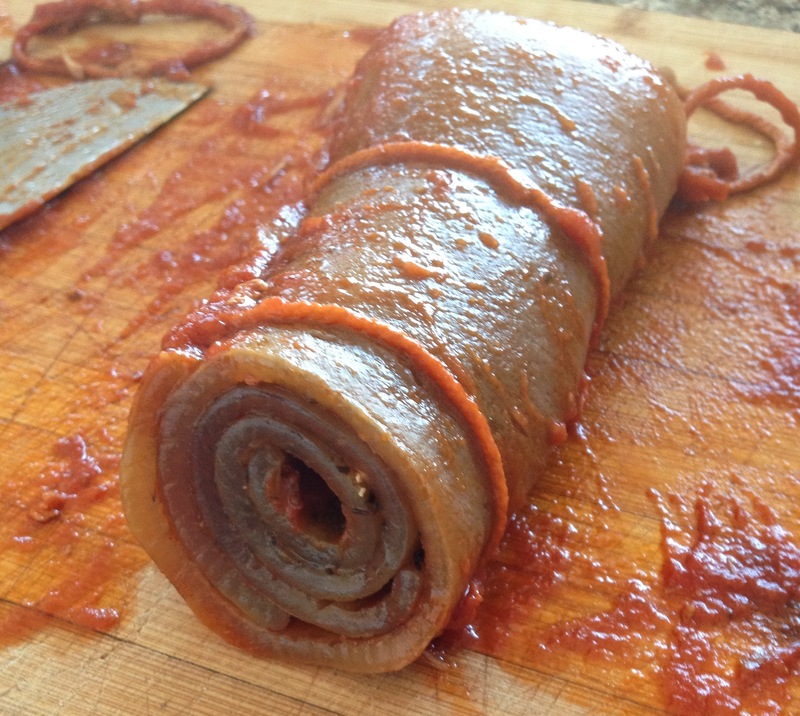 Serve sauce with pasta as a first course, and sliced pigskin as the second course. The Taste- In my imagination, this is what eating a hug tastes like. The Process- Potentially, The only hard part is sourcing some pigskin. After that, it’s a breeze. Pop it on the stove in the morning and a few hours later you have dinner. The Verdict- Make this. You will thank me. In the northern italian region where I live, it’s rumoured that some recipes call for the pigskin with the hair still on. “Scodeghe col pel” should be the name. Sadly, I have never been able to eat one. The marginally less savage version you propose was very popular at my grandmother’s sunday table. In the northern italian region where I live, it’s rumoured that some recipes call for the pigskin with its hair still on. “Scodeghe col pel”, that’s the name. Sadly, I have never been able to eat one. The marginally less wild version you present here was a popular delicacy at my grandmother’s sunday table. I love this and have not had it in years. however the hardest part is finding a source for the skins but i found it and I am going to make it tomorrow – can not wait. Yes, In Bensonhurst Brooklyn we make a stuffing for the pig skin with fixed bread crumbs (bread crumbs mixed with chopped parsley, chopped garlic, Pecorino Romano cheese add olive oil and a pinch of salt and black pepper if you want, mix well to make a paste and spread it on the pig skin, then add some pignoli nuts, and a few raisins. Roll it up, tie it tight so not to lose the stuffing. Drop it in your pot where you already browned some garlic in a little olive oil. Brown the pig skin, add the browned meat balls and browned sausage and neck bones or steak bracioles or pigs feet. Then add your tomatoes sauce, we use Red Pack crushed plain, about 3 large cans and use a blender to liquefy the tomatoes and it takes care of the seeds as well, and season it, we prefer garlic and oregano. Now add the tomatoes to the pot with the brown meat. Let this cook on medium until it’s done, and carefully scrape the bottom of the pot while it’s cooking to mix the flavors of the meat into what has become the GRAVY…it’s not called a meat gravy. Oh, yes one more thing do not dip your Italian bread into the cooking gravy, you’ll sour it. Use a spoon…What’s themattterwith you?..